Ocean pollution is an ever increasing problem that is thankfully starting to get some real media attention. In order to do something about it, first, we must understand the root causes and effects. Not that long ago, scientists believed that the oceans were so vast that they could never become polluted, and had an infinite capacity to absorb and dilute man-made trash. However, minds began to change in the 1950s and 1960s, as people began to question the practice of dumping radioactive waste into the ocean, and notable oil spills caused devastating effects and commanded headlines. Today, 1.4 billion pounds of trash are added to our oceans every year. The North Pacific Gyre has become a floating garbage patch twice the size of the state of Texas, where floating plastic outnumbers local sea life by 6 to 1. Pollution has also caused large dead zones in the Gulf of Mexico and the Baltic Sea. Ocean pollution is a problem that affects all of us. The world has been rocked by a series of famous oil spills, including the Exxon Valdez, the Deepwater Horizon, and the Ixtoc 1. These spills have devastating effects on the marine environment, that last for decades. The SS Torrey Canyon, one of the earliest oil spills to garner worldwide attention, caused an environmental disaster off the coast of Cornwall England in 1967. It spilled an estimated 25-36 million gallons of crude oil into international waters, affecting hundreds of miles of the coastline in Britain and France. 50 years later, oil still remains in this landscape, sequestered in an old quarry in Guernsey, and local hermit crabs have just now begun returning to their native beaches. However dramatic these oil spills are, however, they are not actually one of the primary sources of ocean pollution. Indeed, despite these famous wrecks pouring millions of gallons of oil into the sea all at once, they remain a small contributor to the level of toxic pollution in our oceans. Discharge and runoff: We dump millions of pounds of untreated sewage, garbage, and toxic waste into our rivers. And industrial and agricultural waste, as well as mining pollution and simple urban runoff from roads and highways, also enter our fresh waterways. These rivers, streams, and runoff water all eventually arrive in the ocean, full of contaminants and hazardous waste materials. Ship pollution: While oil spills grab all the headlines, daily shipping traffic and activities have a far more detrimental effect on the ocean. Cargo ships, tankers, and cruise ships all carry vast amounts of ballast water that contain viruses, bacteria, and invasive species, transporting them from one port to another. 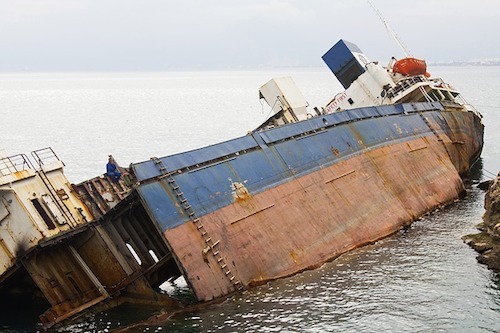 Ships often also carry bilge water that can get contaminated with oil, gasoline, and other chemicals and pollutants from the engine areas of the ship, and then it is ejected into the ocean. A large cruise ship generates an estimated 8 metric tons of polluted bilge water every 24 hours. And ships discharge solid waste in the form of trash and sewage. Large cruise ships have onboard facilities to grind up or incinerate waste before they dump it into the ocean, but it still contributes to ocean pollution. Garbage and litter: A lot of human garbage is transported into the ocean through runoff or through improper dumping in rivers and streams. But garbage and litter that originates on land often ends up in the ocean through other pathways as well. The wind carries plastic bags, or the tide picks up trash left on the beach, or garbage and recycling facilities inappropriately transport trash. Cargo ships regularly lose shipping containers in rough weather, and some countries and companies are still guilty of dumping hazardous waste into the ocean. Over time, plastic dumped in the ocean may become broken down into smaller pieces, but it never fully breaks down and disappears. These plastics are poisonous to ocean creatures and sea birds that eat them, and poisonous to other creatures further up the food chain that may eat smaller creatures in turn. Pollution is often deadly to species that cannot relocate to escape it, like corals and shellfish, and either kills local fish and birds or forces them to change their living and migration habits. Pollutants alter the acidity, temperature, and composition of the water, with far-reaching effects for all the animals in the ecosystem. Recently, cosmetics that contain plastic micro-beads have been banned in many countries. They are just one of many forms of plastic being pumped into our natural water environments on a daily basis. Industrial and chemical pollution isn’t just harmful to aquatic species. Mercury and other heavy metals can be consumed by fish and then enter the human food supply, making our food potentially harmful. Heavy metals bioaccumulate, which means they are at higher concentrations in fish further up the food chain, like tuna, mackerel, and swordfish. People who eat quantities of contaminated fish and shellfish are also subject to this accumulation, eventually causing illness from mercury poisoning. In Japan, mercury discharged from industrial wastewater in the 1930s through the 1960s caused a disorder called Minamata disease, which had killed over 1,700 people by 2010. Today, high-weight predatory fish caught everywhere from New Jersey to Italy test for higher than recommended amounts of mercury. Evaporation from the surface of the ocean is essential for our global water cycle and plays a crucial role in cooling the earth. As we contribute plastics and oils that increasingly cover the surface of the ocean, we threaten the foundation of the processes that make earth habitable. It’s clear that we need to clean, protect, and care for our oceans in order to protect and care for our whole planet. While protecting the ocean is a huge job, involving international agreements, commerce, and regulations, it’s also worth remembering that our household trash and bad habits contribute to ocean pollution, no matter how far inland we are. Recycling and properly disposing of plastics, controlling excess water usage, chemicals and fertilizers on our lawns, and reducing contaminated runoff from our own homes in the form of oil leaks, solvents, and other products that can end up in storm drains, can make a difference. Ever wondered why the oceans are salty? Find out why in our latest article. We’ve also got a great article explaining the causes of water shortages. Make sure to check us out on social media. We’re active on Facebook, Google+, and Twitter. Follow the icons in the top right corner of the page.